She carries her head high with a long thick midnight black braid reaching down to her withers. Eyes the color of the clear winter sky. Her human skin is a deep bronze going into golden well muscled equine body. Her points and Tail also the color of her braid. Centaur picture from Syreene. Full size picture can be found here. Natural 19/20 gives 3x damage or unseats opponent. Must call intention 1st. Unseated suffer 1D6 damage and take 1D6 from fall (if no roll/fall). Fallen rider loses init and next attack. Unseat can also happen if modified 19/20 or higher. Can instead choose disarm, any successful called shot strike not parried/dodged knock off weapon, shield, or non-bolted helmet. + 1 Initiative +1 Roll +2 Parry/Dodge + 1D6 damage Special- Karma must only be moving for previous to apply. Does not get bonuses if flat-footed or crowded. Does not apply to Archery. Charge attack- Running strike with lance, pole-arm or spear + 3D6 Damage. Counts as 2 attacks. If 2nd percentage not successful, Karma is flat-footed (jarring hit). Against supernatural beings, gods & their minions, and creatures of magic, using 3D6 PPE and 2 attacks, the Palladin can bypass the natural AR of any creature, inflicting full damage plus PS bonus. If the character is impervious to normal weapons they still take 1/2 damage! Must be a hand held weapon (no thrown or archery) or kick/punch. Standard lance, Whip, Cross Bow. summer clothing, purple crisis trucker hat, Glaive map pack from Horoth Wavestrider. Money in chest. Humara Krins, Mace, Whip, Cross Bow, Cloak, Saddle bags, Eye of Thoth on necklace, Winter clothing worn, 2 Large Sacks, 2 Small sacks, water skin, tinder box, Eternal Torch Ring on Right ring finger, 2 Vials of Holy water. 11 Bolts. Iron Shield w/Eye of Thoth, Magic Tent: Inside always dry and warm (70 degrees). Protection from elemental forces. +3 save elemental magic. Cannot protect against major act of nature., Small muddy quartz, furs, sealed pouch, smoked beef 1 day, Saddle bags, 2 Vials of Holy water. Anti-Slavery Pin. Furs, sealed pouch, smoked beef 1 day, 3 scrolls Magic Pigeon by Thoth (10th level). 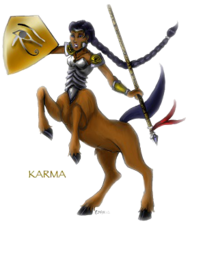 Karma was born youngest of 7 children in the noble house of Proudhoof of the Ophid’s Grasslands. From a young age, realizing that there was nothing for her from the family, she sought amusement by visiting Me’zfii Onh and fell in with a rough crowd. There she learned some simple burglary skills. Her grandfather a worshiper of Thoth, the only member of her family she respected, lay dying and requested that she visit him before his time came. He commanded that she become a paladin and give up this rebelliousness she had grown so fond of. Being eighteen, and considered by most to be too old to begin, she excelled in her training. She was aided by some of the skills she learned as a street tough, but many of the skills had to be re-learned or replaced entirely. After finally completing her training and being invested as a full fledged paladin, she went out into the world to find a place she could truly make a difference. In her travels, she has fought in battles, helped slay a giant, protected villages and protected the peace. She has aided rebellions against unjust rulers, and protected just rulers from rebellion. She has brought a warlord to his knees in the heat of battle. That noble was Jonath Miagina, of the Western Empire’s House Miagina. For this she is wanted by both House Miagina and its regional house, House Belopo. Through it all, a sense of unease has followed her. She still has not found the place that Thoth, her god, has prepared for her in this world. Karma was born under the sign of Majestic the Unicorn. Those born under the sign of the unicorn seem to be wild at heart and at home in nature.